The European Bluegrass Blog: Bluegrass band at the Eurovision Song Contest? I am just sharing some good bluegrass news from Norway. 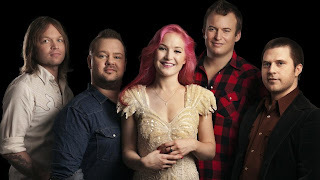 Lucky Lips, the '#1 European Bluegrass Band 2012' at EWOB 2011, is in the finals for the Norwegian contribution to the Eurovision Song Contest. They will be one of the ten final bands competing the coming weekend, and the winner will be the Norwegian representative at the contest. Their song, 'Sweet and heavy', is written by their young bandleader and singer, Malin Pettersen. After a screening process by the selection committee, twenty-four bands have been competing over the last three Saturdays in big TV productions with open voting. Nine bands were selected by the Norwegian people; the tenth band, called the 'wild card', was chosen by a committee of real heavyweighters on the Norwegian music scene. They chose Lucky Lips. As one of them said, 'It is a beautiful song, probably too good for the Eurovision Song Contest.' So, now we cross our fingers. You can hear 'Sweet and heavy', and see its accompanying video, on the Lucky Lips website and on YouTube.